As it happens, here in Payson at 01:15 am on the morning of Tuesday, 21st December, low broken cloud was obscuring the moon much of the time. But nonetheless the pale outline of the darkened moon was visible, sitting above the constellation of Orion. Very, very mystical. Here’s what it looked like without the cloud, thanks to a Google search for images. And a late update, thanks to Pete N (via Facebook) who spotted this wonderful video recently placed on YouTube. which then highlighted this video taken by the Kurdistan Planetarium – these are amazing examples of the power of our new virtual world in sharing images across so many peoples. If you want to see this solar eclipse then read the times carefully – to assist, I am publishing this Post much earlier than normal, at 18:00 US Mountain Time (UTC -7hrs) on Monday, 20th December. Oh, and more information at Spacedex here. That is, except during a lunar eclipse. A similar lunar eclipse in Nov. 2003. Credit: Jim Fakatselis. Earth’s shadow. For 72 minutes of eerie totality, an amber light will play across the snows of North America, throwing landscapes into an unusual state of ruddy shadow. If you’re planning to dash out for only one quick look — it is December, after all — choose this moment: 03:17 am EST (17 minutes past midnight PST). 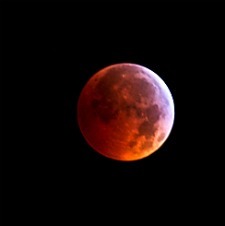 That’s when the Moon will be in deepest shadow, displaying the most fantastic shades of coppery red. From first to last bite, the eclipse favors observers in North America. The entire event can be seen from all points on the continent. Click to view a world map of visibility circumstances. Credit: F. Espenak, NASA/GSFC.